To break the bone and have it displaced, all three legs must be broken. This is why cheek bone injuries are often called ‘tripod’ fractures. The legs get broken and the main body of the cheek bone falls down and in. In essence it rotates down and into the maxillary sinus. This is the classic and almost always direction of cheek bone displacement as its main supporting leg, the posterior maxillary buttress collapses. 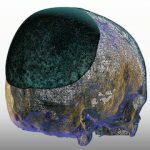 In repair of displaced cheek bone fractures, the most important ‘leg’ to adequately restore is the posterior maxillary buttress. This is approached through an intraoral incision where it can be directly seen. 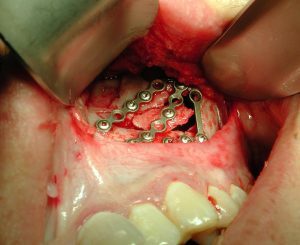 The main body of the displaced cheek bone is lifted up and out of the sinus and the posterior maxillary buttress length and alignment restored by stabilizing plates and screws. Often segments of the thin maxillary sinus wall are put back together to cover the open sinus. But these bone segments are a lot like eggshell pieces. But they do prevent the soft tissues from collapsing into the sinus. While other bony buttresses may need to be aligned and secured (infraorbital rim, lateral orbital rim), and doing so is a surgical judgment to their necessity, posterior maxillary buttress reconstitution is an absolute must. 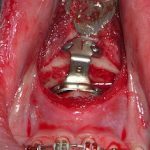 For many cheek bone fractures intaroral access and re-estaboishment of the posterior maxillary buttress length and alignment may be all that is really needed.